Our goal at Lucky Cat Laundromat is to provide you, the customer, and the community with the highest quality laundry experience possible. We are the area’s most environmentally friendly laundromat, with full time attendants to ensure regular maintenance and state of the art, high efficiency equipment that saves water and energy, gets your clothes cleaner, and in turn saves you money. Lucky Cat Laundromat also pledges to support local organizations that rescue, foster, and provide medical care for felines. Our machines boast the highest energy efficiency available, so we’re not only saving you money, but the environment as well. Lucky Cat Laundromat proudly endorses local organizations that rescue, foster, and provide medical care for felines. Full-time attendants on-site from open until close to maintain mechanical components of the laundromat, as well as a family-friendly, safe environment. 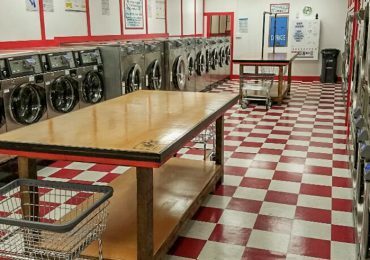 Lucky Cat Laundromat is the Capital Region's PREMIER self-service laundromat, offering state of the art, high efficiency stainless steel washers and dryers capable of handling even your largest, toughest laundry needs. Our machines boast the highest energy efficiency available, so we’re not only saving you money, but the environment as well. Your clothing and textiles will get cleaner faster, using less energy, less water, and less detergent. We’re better for the environment, your community, and your wallet. Full-time attendants will be on-site from open until close to maintain not only the mechanical components of a laundromat, but a family-friendly, safe environment as well. High efficiency LED lighting keeps the building and parking lot bright and welcoming, and 24-hour surveillance protects you and your valuables. You, our customers, deserve a comfortable, luxurious laundry experience. Lucky Cat Laundromat proudly endorses local organizations that rescue, foster, and provide medical care for felines. A portion of our profits will be donated to local shelters and organizations to support the spaying and neutering of our community’s feral cats to ensure the health and wellbeing of all of our feline friends. Feral cats are too fearful to be adopted and feral kittens young enough to be socialized overpopulate shelters, causing a rise in euthanasia rates for all cats. Our Loyalty Card Program, provided by Fascard, allows customers to add money to their Loyalty Card to use at any machine in the laundromat with cash or credit at the kiosk, or download the Fascard App to use alternative payment methods, and receive bonus cash on their card and allow them to take advantage of special promotional offers. Visit laundrycard.com for more info. Learn how to use our loyalty program now! Our Wash & Fold Service is temporarily suspended. Follow us on Facebook for updates!